By Otmar Lahodynsky, Europe Editor, profil, Vienna, and newly re-elected President of the European Association of Journalists. “The future is Europe“ reads a giant poster in Brussels’ European quarter in Brussels. Paid for by a businessman, it seems a little desperate against the backdrop of the EU’s current situation. For the first time in its history the EU is poised to lose a member, the United Kingdom, the third largest economy in the EU, a permanent member in the UN Security council, and a nuclear power. It is at best unlikely that the deal between the EU and UK, manifestly worse than existing arrangements, will pass parliament in London this week. A hard Brexit, as in the worst kind of expensive divorce, still looms, with consequences for all of us. My ex-colleague as Brussels correspondent, Boris Johnson, continues to recite the mantra (though more vaguely now) awaiting the shiny future “Global Britain” once freed from the shackles of the EU. And some of the more deluded Brexiteers such as Nadine Dorries MP go so far as to vilify Mrs May’s deal on the basis that there will then be no British Commissioner or MEPs. Pity Michel Barnier and admire his patience. This is simply crazy. You leave a tennis club and expect free hours on the courts and snacks and a well-paid seat on the management committee? Centrifugal forces weaken the Union. Right-wing governments as in Italy, Hungary, and Poland pretend that the nation state can handle current problems better than a Union of 28 countries. A child can see that even Germany, the largest and most powerful Member State, is on its own weak going on helpless in the face of mass-migration, climate change, terrorism, noxious targeted disinformation, not to mention Russian nerve-gas attacks and the looming trade conflicts with Trump’s USA or China. The EU is also being weakened by several Member States refusing to respect common, agreed rules to guarantee the functioning of a Union with (for most of them) a common currency, a common foreign and security policy, and closer cooperation in justice and home affairs. The Italian government apparently doesn’t care a fig about agreed limits to national debt, and simply ignores the verdict of the Commission. Hungary and Poland have refused to accept a quota to settle migrants from Italy or Greece in all EU countries so as to relieve the burden on the few. Hungary and Poland face a procedure of Article 7 of the EU Treaty because of unacceptable restrictions on the independent judiciary. An infectious revolt. It is an irony that the Polish government rejects the notion of solidarity when the first free trade union in the Communist bloc was founded in Poland back in 1980 and was called Solidarnosc. Some countries seem to mistake the EU for a kind of ATM which distributes huge subsidies but never needs to be filled up, not anyway by them. A union with members acting like this plainly cannot function. “Unity in diversity“ is a guiding principle of the EU. It is being used to justify a kind of blind selfishness. Next May’s European elections, perhaps the most significant since direct elections started in 1979, will see a stark choice between pro- and those which are anti-European parties. Some surveys predict strong support for anti-European candidates, with the American Steve Bannon seeking to unify the far right. But what do these forces have in common except being anti-EU, and as nationalists not having much time for each other? There is and can be no international movement of national forces. We have seen in the past how quickly such a group dissolves. Out of the blue, a Romanian fascist was at war with a pro-Mussolini MEP who wanted to expel all Romanians from Italian soil. And French Le Pen supporter really has little in common with a German neo-Nazi except bad temper. But of course they are all openly or secretly supported by Russia, where Vladimir Putin has as little interest as Trump in a united European Union, and has played a shadowy role in the Brexit imbroglio with his army of Internet trolls. Yes, I agree with the lone businessman in Brussels. Our future really is Europe – but one that is united and as strong as we can make it. The alternatives, if looked at at all closely, are as unappetising as a “Global Britain” with a collapsed currency and without friends, even Trump, daydreaming of becoming an offshore Singapore. Do we want to imitate the US model? Individual freedom without social rights and a steadily wealthier top tier of plutocrats, while – outside Silicon Valley and Wall Street – nearly everyone else sees falling or stagnant pay, and fragile, insecure MacJobs? Or perhaps the Chinese model of capitalism with tanks appeals? What about the Russian way? Life under a dictatorial President who knows what’s best for you, sends his critics and rivals to jail, or worse, and presides over an economy based on selling natural resources? I can only hope that the European voter is intelligent or at least prudent enough to rediscover the values of European civilisation and solidarity, to recognise there is no other realistic or hopeful way forward. In May next year the extremists and fantasts should stay where they have been for the last few decades: a noisy minority in the European Parliament. Many towns claiming to be the birthplace of Santa Claus have seen unseasonal temperatures. It was an honour to host the Irish Ambassador, Her Excellency Maeve Collins at such a timely moment in history. While her talk and our discussion was off the record, most of us will agree that whatever was said could change within 24 hours and hence, any report would no longer be applicable or trustworthy. She was not only gracious but astute in her observations regarding Brexit. The party was held at Nomad Cellars, a private wine club in the heart of Helsinki. Since most of us would be indulging in Finnish Christmas at a later stage, Indian food was served with samosas as starters, curry chicken and dhal as a main course and a chocolate-mascarpone cake for dessert which Bilal Dalklic, a board member, generously donated. Thanks to André and Bilal for helping with transportation and setting up. Here’s wishing you all a merry Christmas and a very happy New Year. 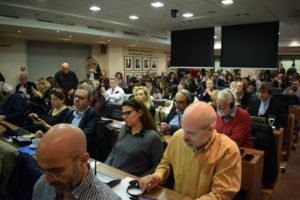 Agrinio, Greece, 2018 The question was described as ‘curious’, ‘amazing’ and ‘existential’ by the various panellists who shared their views with delegates from 15 countries attending the annual congress of the Association of European Journalists in Agrinio in November 2018. Glimmers of optimism were threatened by a sombre mood enshrouding the problems facing Europe. With unemployment at 20% in Greece, 40% for youth between the ages of 18 and 25, attitudes towards systems that have failed them are influential in potentially discarding traditional values. Greece is not alone. Spain and other countries, see their young people performing jobs well below their graduate status or not at all. Not for the first time, populism is rearing its ugly head once more, preaching to the sceptics of the EU as well as to the disenfranchised whose opinions of refugees strengthen their resolve to keep them out. The message from the Mayor of Brussels, Christos Doulkeridis, was touching in its sincerity. He apologised to refugees as an EU citizen for the way Europe has behaved towards them, he apologised that the EU has not done enough to keep Britain within the ranks even though it was their chivalry that saved Europe during WW2. His own story is one of gratitude to the people of Belgium and Brussels in particular that made it possible for a Greek like him to flourish and get to the position that he is in today. His message of tackling the onslaught of difficulties is for Europeans to stand together, for politicians to have a common goal in order to pave the way for future democracy. Climate change was on everyone’s agenda and there was no doubt that this could not be faced by individual countries or for that matter by the bloc on its own and that the refusal of President Trump of the USA to sign the Paris Treaty, is a blow to a vital unified approach. According to Otmar Lahodynsky, President of the AEJ, journalists have been given the mandate to fight for solidarity highlighting the severe approaching storms and make citizens aware of the added value of a unified Europe to remain democratic. 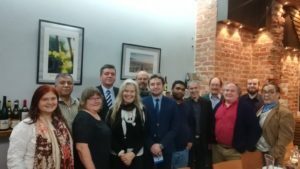 On 6 December 2018, nine partner organisations of the Council of Europe’s Platform for the Protection of Journalism and Safety of Journalists conducted a press freedom solidarity mission to Slovakia to press for full justice in the case of assassinated journalist Jan Kuciak and his fiancee, Martina Kusnirova, who were murdered on 21 February 2018. The delegation – from the Association of European Journalists (AEJ), the Committee to Protect Journalists (CPJ), the European Federation of Journalists (EFJ), Free Press Unlimited, Index on Censorship, International News Safety Institute (INSI), International Press Institute (IPI), PEN International, Rory Peck Trust, along with representatives from the Council of Europe’s Platform for the promotion of journalism and the safety of Journalists – met with officials of the Interior Ministry and the Presidium of the Police Force to monitor the progress of the investigation into the assassination. The delegation welcomed the arrest of four individuals in relation to the assassination but stressed the urgent need for all those who commissioned the assassination to be brought to justice. Authorities assured that the investigators are “rigorously pursuing all lines of inquiry to establish who ordered the assassination.” The delegation notes that personnel changes within the police in the aftermath of the assassination are widely seen in Slovakia as having strengthened the investigation. The delegation asked for clarification from the authorities as to why an assessment was made that the threats which Jan Kuciak reported to the police prior to his assassination were not considered serious enough to warrant an investigation. The delegation stressed that unless systematic changes – at a legal and policy level – are introduced which ensure the safety of journalists and their sources, journalists in Slovakia will continue to be vulnerable. The delegation urged that current, internal discussions within the Ministry of Culture on legislation relating to the press should lead to measures that materially strengthen the legal framework for the protection of journalists. The delegation also visited the office of Aktuality.sk to learn more about the climate for press freedom and the safety of journalists in Slovakia following Kuciak’s assassination. Peter Bardy, editor of Aktuality, said that while prior to Kuciak’s assassination “investigative journalists felt invincible, now we are much more cautious.” Finally, the delegation laid tributes at the memorial for Kuciak and Kusnirova in central Bratislava.